LUMINEERS â€“ the painless way to bring out the beautiful, healthy, natural, permanently white smile in you. Ultra-thin LUMINEERS are custom designed to give you the beautiful smile youâ€™ve always dreamed of. Unlike traditional veneers, there are no shots, no drilling of sensitive tooth structure, and no pain. Theyâ€™re even reversible, so you have nothing to lose and a beautiful smile to gain. Plusâ€”LUMINEERS are proven to last for over 20 years, so your beautiful smile will be with you for years and years. 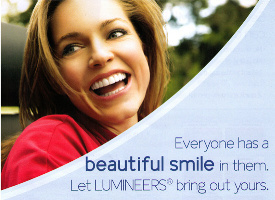 And now, in addition to LUMINEERS, you can ask your dentist about LUMINEERS with LUMINATE in LUMITray Technology. Itâ€™s new technology that allows your dentist to place your veneers all at once, instead of individually. Plus, it offers exclusive digital design and preview technology, which all adds up to less time in the dentist chair! Transforming your smile couldnâ€™t be any easier; in fact, it takes just 2 easy visits. Whether you transform your smile with LUMINEERS or LUMINEERS with LUMINATE in new LUMITray Technology, it takes only 2 easy visits to your dentist to bring out your beautiful smile. During your first visit a precision mold will be taken. You and your dentist will also choose the right shade for your new, permanently white smile. On your second visit, your custom designed LUMINEERS are checked for fit and shade. Then, theyâ€™re painlessly attached. Thatâ€™s it â€“ a healthy, natural, permanently white smile youâ€™ve always wanted in only 2 visits! 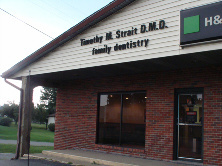 Copyright Â© 2013-2017 Strait Smiles Family & Cosmetic Dentistry, Dr. Timothy M. Strait, DMD. All Rights Reserved.